Data presented at the AACR Annual Meeting 2016, on April 19, showed that a microdevice about the size of a rice grain, when implanted into a tumor in a preclinical model, could release up to 100 individual cancer therapeutics or combinations, and upon retrieval from the tumor and analyses, could identify the best treatment option for that tumor. The research team in now testing the device in humans. Oliver Jonas, a postdoctoral fellow appointed jointly in the laboratories of Robert S. Langer, ScD, the David H. Koch Institute Professor, and Michael Cima, PhD, a David H. Koch Professor of Engineering, at Massachusetts Institute of Technology, presented updated data on the microdevice design and its applications. Jonas continued, “Currently, there are about 150 cancer drugs approved by the FDA, and many cancer patients have different drugs to choose from to treat their specific disease. However, patients respond differently to different drugs, and often, no two patients have the same response to a specific drug.” It has been a major challenge to determine which drug or combination of drugs to give to which patient, he added. “Being able to identify the right therapy that will work optimally for every patient will be a major advance,” Jonas said. 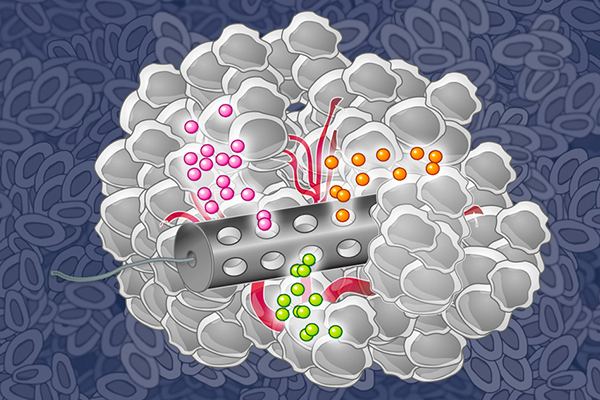 When implanted in a tumor, the therapeutics, loaded in specific reservoirs within the device, are released in such a way that crosstalk between the different drugs is eliminated by taking into account the chemistry of drug and formulating them appropriately to separate the reservoirs from each other. The researchers can also adjust the drug-release rates to mimic the concentration of the drug achieved by standard systemic delivery, according to Jonas. Traditionally, there are two approaches to systems biology, Jonas explained. One approach is to study the effects of multiple drugs on one type of cells in the laboratory, and the other is to conduct whole mouse studies where one could only test one or two agents at a time, which takes a long time and comes at a high cost. 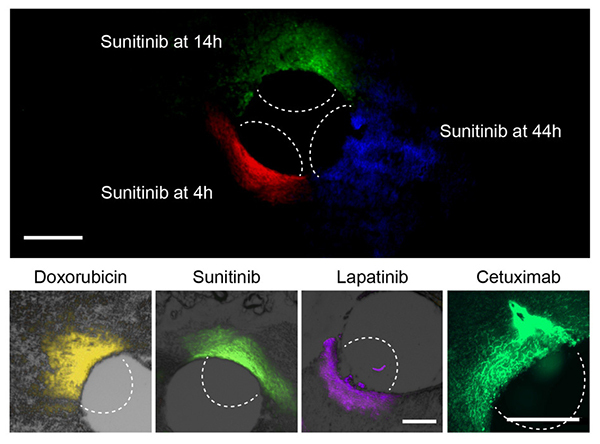 Jonas and his colleagues have so far tested the effects of many drugs in patient-derived xenograft mouse models of melanoma, and prostate and breast cancer. In recent studies, they tested the sensitivity of estrogen receptor-positive breast cancer to single agents and combinations that target the ER, CDK4/6, PI3K, and other pathways. The research team has initiated a clinical trial to test the safety and feasibility of placing and removing the microdevice in patients with early-stage HER-2 positive or triple-negative breast cancer.